Washington, D.C. – May 24, 2012 – Achieve today released a report laying out a blueprint for increased engagement between state education leaders and the career and technical education (CTE) community. The report, Common Core State Standards & Career and Technical Education: Bridging the Divide between College and Career Readiness, was developed in partnership with the Association of Career and Technical Education (ACTE) and the National Association of State Directors of Career and Technical Education Consortium (NASDCTEc). With the adoption of the Common Core State Standards (CCSS) by 46 states and the District of Columbia, there is a tremendous opportunity to rethink the role of literacy and mathematics not only within academic classes, but also within CTE courses and pathways and encourage more collaboration and integration between educators across disciplines. 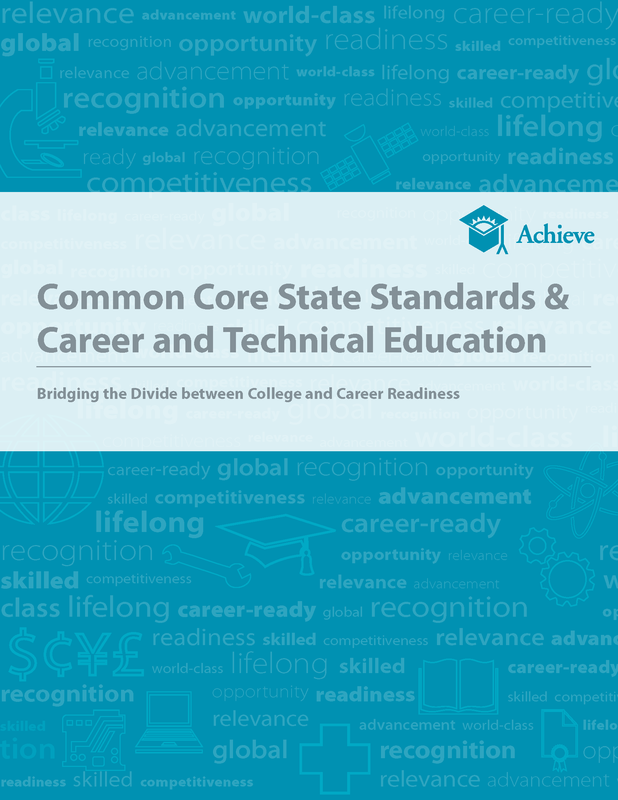 "The Common Core State Standards have the power to transform U.S. education and ensure it is anchored in the goal of graduating all students ready for college and careers," said Michael Cohen, President of Achieve. "The CTE community has a critical role to play in this work. CTE courses not only reinforce and provide real-world context for the new math and ELA/literacy standards, but, if aligned with the CCSS, can also provide students with multiple opportunities to master and apply college- and career-ready knowledge and skills." Janet Bray, Executive Director of ACTE said, "Common Core State Standards implementation presents tremendous opportunity for CTE and academics to better align to improve student career readiness, but too many states and school districts are neglecting this important connection point. This paper is a key tool that will help guide state and local leaders and improve understanding about how to include CTE in the Common Core implementation process. Our hope is that all school leaders will follow the good examples provided by these leading states." The paper outlines a set of strategies state and district leaders can leverage to ensure the implementation of CCSS engages, informs, and benefits from the career and technical education community as a partner in the broader college- and career-ready agenda. Strategies highlighted include examples of practices currently employed in states across the nation, such as forming cross-disciplinary teams for planning and implementing the CCSS, enhancing literacy and math strategies within CTE instruction, and fostering CTE and academic teacher collaboration. "CTE State Directors are pleased that education leaders recognize that CTE has a critical role to play in ensuring that students are ready for college and careers," said Kimberly Green, Executive Director of NASDCTEc. "We have united around a vision to develop a shared set of standards that meet a quality benchmark for CTE students and plan to align them to the Common Core State Standards. We know that consistent, rigorous standards are essential to improving our nation's schools and preparing students to succeed." "The concept of college and career readiness represents a sea change in the way we think about public education. States leading Common Core implementation are supporting educators to shift the structure and focus of their schools and classrooms to reflect this change – the standards emphasize problem solving, written communication, and reading comprehension," said CCSSO executive director Gene Wilhoit. "In order to successfully prepare students for college and career in this way, implementation must not be a responsibility relegated to just a few staff within a state, district, or school, but ingrained in the system's collective goals, across departments and throughout the state." Common Core State Standards & Career and Technical Education: Bridging the Divide between College and Career Readiness can be found at: www.achieve.org/CCSS-CTE-BridgingtheDivide. Created in 1996 by the nation's governors and corporate leaders, Achieve is an independent, bipartisan, nonprofit education reform organization based in Washington D.C. that helps states raise academic standards and graduation requirements, improve assessments, and strengthen accountability. In 2005 Achieve launched the American Diploma Project Network. Starting with 13 original states, the Network has now grown to include 35 states educating nearly 85 percent of all U.S. public school students. Through the ADP Network, governors, state education officials, postsecondary leaders and business executives work together to improve postsecondary preparation by aligning key policies with the demands of college and careers. Achieve partnered with NGA and CCSSO on the Common Core State Standards Initiative and a number of its staff served on writing and review teams. More recently, Achieve was selected to manage the PARCC common assessment consortia. For more information about the work of Achieve, visit www.achieve.org. The Association for Career and Technical Education is the nation's largest not-for-profit education association dedicated to the advancement of education that prepares youth and adults for successful careers. It provides advocacy, public awareness and access to information, professional development and tools that enable members to be successful and effective leaders. Founded in 1926, ACTE has more than 22,000 members, including teachers, counselors and administrators at the middle school, high school and postsecondary levels. For more information about the work of ACTE, visit www.acteonline.org. The National Association of State Directors of Career Technical Education Consortium (NASDCTEc) was established in 1920 to represent the state and territory heads of secondary, postsecondary and adult career technical education (CTE) across the nation. NASDCTEc, through leadership, advocacy and partnerships, aims to support an innovative CTE system that prepares individuals to succeed in education and their careers, and poises the United States to flourish in a global, dynamic economy. For more information about the work of NASDCTEc, visit www.careertech.org.